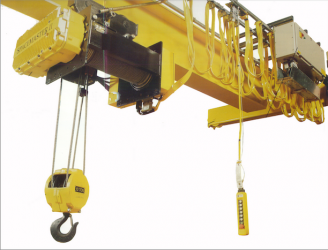 Service, repair, and occasionally build Industrial Cranes throughout Western New York. Work with: Three phase, Motor Controls with AC and DC, Frequency Drives, and Electrical Drives. Pull wire and run conduit. One, two, or three man teams are sent on service calls to industrial facilities all over the region to keep these mechanical marvels working. Most of the time you will work 7:00 to 3:30. But sometimes you work when your client is not. On the upside you’ll get paid time and a half or double time. Most of the time, cranes live in a tempered environment. On occasions they live in the cold..or the hot. And for those times when you’re away from home, it’s the little things that may make it more palatable. You get some spending cash–and your own room. Once you earn company clout, you’ll get a company truck. In the mean time the other perks are a nothing to sneeze at. You get profit sharing, a 401k with a company match, uniforms, cell phone, mileage reimbursement, an allowance for boots and prescription safety glasses. After only one year in, you’ll get two weeks vacation time. Show us mechanical and electrically inclined, and we’ll introduce you to a solid career.